So, the box office smash of the year. The Hunger Games. I'd never even heard of this book till I saw the previews for the movie and I have to admit I was intrigued to find out more. Children sent into an arena to fight to the death. Kind of reminded me of Thunder Dome. "24 go in 1 comes out." Ok, maybe not. I purchased the book from good old amazon.com for less than $10 brand spanken new. A pretty good deal if I may say so myself. I liked how the author throws you right into the story. Books that make you read 20 chapters with out even getting to the point of the story annoy me half to death (A.E. Shiver, but that's another book review.) The story starts out with the reaping which is an interesting concept and before you know it you're on a train headed to the capitol. Soon after the Hunger games begin. I got really excited when I got to this part. I know I shouldn't have because its senseless killing of innocent children, but I wanted to know how Katniss will get out of this situation. Everything rolls along fine but I notice there is a lot of dead space where days roll by and nothing happens. The main character just sits around waiting for something to happen. I was able to get passed this small annoyance once the story got going again. Then there was the love story. All of a sudden a love story is thrown into the middle and the characters are hanging in a cave for days on end. I understand that Peeta (Who is named after bread) is hurt and needs to heal, but you got to keep the story moving along. The whole time she's in the cave I keep thinking about the mysterious Character Thresh who has been hiding this whole time and no one has seen him. What happened to him. Oh, there he is, and he's gone again. Then the next thing you know, he's dead. I felt this was a cop out because she built this interestingly mysterious character and then did nothing with him. I was a little disappointed. Of course there were the weird mutant tributes that came out of no where, didn't really fit, but hey, I've written some weird things too. Who am I to judge. The end was a cliff hanger, but not a very convincing one. I'll still read the next one just because I'm interested in the story, but I would have liked a little more from Katniss and Peeta than them being mad at each other. All in all I would have to give this book an 8 out of 10. It was entertaining, original and moved along at a good pace (Most the time), but I didn't really like the writing style and I also thought I found a few typo's but maybe that's just me. 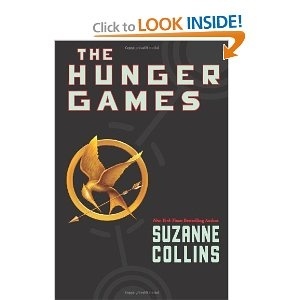 So, if you're looking for a good quick read, I would suggest picking up the Hunger Games.